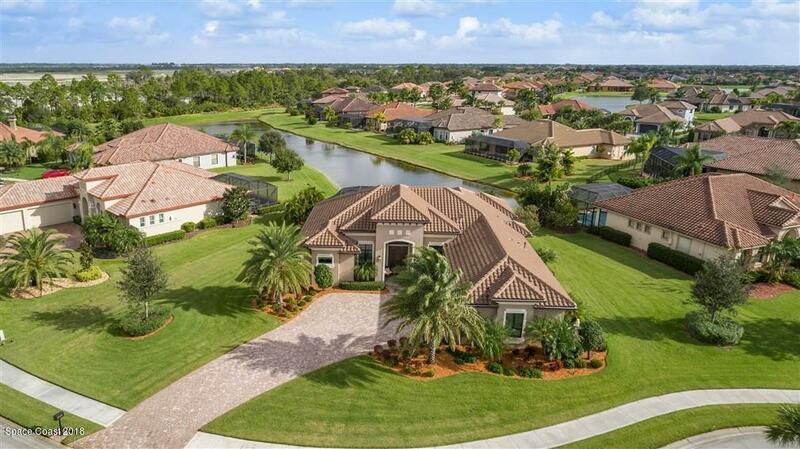 Custom built home on one of the largest prime lake lots in Viera's gated Charolais Estates. Situated on .46 acres on a cul-de-sac, this meticulous home has manicured lawns, a long paver driveway and magnificent lake views from the gleaming saltwater pool! With a sought after N-S orientation, this home and beautifully landscaped lot are a true find! Built in 2014 by one of area's top luxury builders, home has all the custom features you would expect! Crown moldings, 8' doors, tray ceilings, detailed trim, porcelain tile, hardwoods and Smart Home features! Island kitchen has flat serving counter, built in oven and micro, pot drawers, gas range with auto fan, custom backsplash, granite counters and wood floors. Enjoy breakfast surrounded by full wall aquarium glass while looking at lake!